Black Horse may have galloped off with the MK Summer League – again – but only five points spanned the three squads battling for runner's-up spot. 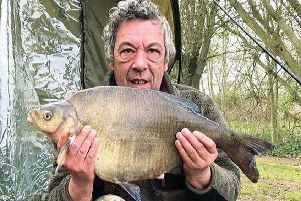 With the match spread across Tear Drops and Lodge, it was Tear Drop 4 which provided the frame-fillers led by Tackle Hub Gold's Paul Chapman with 27-12 of bream. 'Hub Platinum's Rolly MacEneany had 24-10 and Maver MK Black's Roger Clutton 18-10. 'Hub Gold topped the 10 team field with 8 points on the day ahead of 'Horse Black 14 and MK Black one point adrift of that. Overall it was no contest as 'Horse Black romped the series with a 52 point tally as MK Black totalled 70, 'Hub Gold 71 and MK Green 75. And it was just as tight in the individual title as Rob Dzialak and Kevin Green tied on 11 points – Rob going top on weight by 83-13 to 44-15. Paul Chapman was third on 13. GOOD carp have been being caught from the usual places this week, with 'Nick' (reporting through Water's Edge) getting a 27 from Black Horse, and Rob Bara a Rocla 18. Harry Burr netted a 22-5 from Furzton, while Lodge saw Russ Long landing an 18-14 as Steve Lindop had 'split fin' at 17-10. Ade Watson caught a Big Pit 18-4. Monday morning was busy as Roy Crigliano banked five to 23-8 on home-made baits from Lodge and Michal Majcher had a similar number of nice doubles from Furzton. UPPER Ouse barbel captures are still scarce as rocking horse droppings, so Jon Cooper took an away-day to the Newark Trent where he got his rod well bent by an 11-2. ALDERS, midweek: Graham West 246lb, Terry Lancaster 135lb, Trevor Price 134lb. KINGFISHER, Boddington: Lee Richardson 67lb, Mircea Peredercu 37-15, Austin Maddock 30-1. TOWCESTER Vets, Ifield Farm: John Balhatchett 51-6, Grenville Reid 31lb, Rob Aytill 23lb. MK Vets, ST James Lake, Brackley: Austin Maddock 20-10, Colin Chart 17-6, John Robinson 16-4. CALVERT, Woodfields: Dave Lewis 7-15, Ron Hillier 5-2, Barry Witteridge 4-2. FURZTON FESTIVAL charity matches: Sat (Aug 26) 'float only' and Monday Frank Swan memorial open, also carp open Sep 15-17, call GoneFishin 01908 313158 for all three. OTHER fixtures: Sunday, Black Horse Lake open, Water's Edge 01908 690969; Sept 9, MK individual league, Brush Mill and Toombes, 01234 713144; Tues Sep 12 Olney open and Sep 17 Citizen Cup Olney Ouse open – 01234 240061 for both.